is all about jewellery-making by hand and anything else that either helps or hinders my creative process. 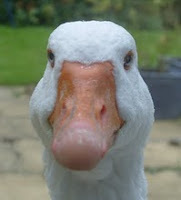 I am participating in Mrs. Denise Nesbitt's wonderful alphabet-theme-challenge, abc-Wednesday, Round 7. This week's letter is 'H'. My choice of H-word is 'Happiness', something that we are not always aware of that we have, until we lose it. Or sending bubbles to Wonderland. Fairy tales, so ever after. Come, make me happy, take my hand! to find a Swedish version of this poem. 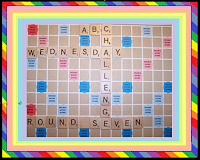 To see more posts with H-words in - H-posts, please visit ABC-Wednesday, Round 7 here. Eller bubblor sända till Samarkand. Kom, gör mig lycklig. Tag min hand! A delightful contribution and lovely start to my day. this is so full of happiness!!! Det er virkelig et sannhetsord - vi vet ikke alltid hvor godt vi har det, og den illustrasjonen var perfekt! Happiness is a great choice for H day. And the lovely girl looks happy blowing her bubbles. Happiness is to be found in your beautiful photo and in your poem! Thank you for sharing it. We don't realise how happy we are, living in a free country with kind neighbours and always a roof over our heads, always enough food on the table. Let us share happiness and peace! A simple yet very telling post! What you say is so true and that rhyme is sweet! That's a very beautiful and so joyful picture ! You can see the happiness in her eyes. If I could see yours I know I would see it there also. Having her has to bring you great happiness. Love your choice for the H Day! Such a lovely capture and such beautiful words! Great way to start my day! Enjoy the rest of your week! Happyiness runs in a circular motion, Donovan sang. I think he was right. How fun! And, whimsical! The images alone were boudning with happiness, but the poem was an added bonus! 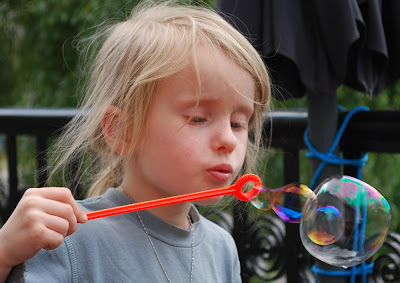 We all had the most fun playing with bubbles as a kid, I'm still glad the kids nowadays have a chance to play with the bubbles too, perfect getaway from the electronic games they usually are stuck with! Surely a happy post, beautiful child and wonderful poetry! What loveley pictures - especially of your daughter! What a great post for H! O va bra gjort. Jag har aldrig forsokt skriva pa Svenska...mer an brev. Jag hadde manga brevkompisar. Det ar nog inte ratta ordet...men jag hittar det inte... Och det ar sarskilt bra att kunna vers sa fin i tva sprak. Du ar duktig! Such a cute post! Especially the picture of your daughter blowing bubbles. For Challenge No. 23, 'First Love' - 14th October 2011 - Thank you Denise and Francine for this award for encouragement! Once again for Challenge No 26 for my story about 'Jacob and Jenny' on 7th December - Thanks Denise! Thank you for this Award Denise! I've received the 'Fair Dinkum' award! To read Betty Gelean's review click on image here or the page under the heading with the title, 'P. Rockwell'. To read a good definition click here. Do you live in Scandinavia? Click on red logo! Bor Du i Norden? Klicka på det röda märket! Anna's Adornments is a blog about jewellery-making and anything else that either helps or hinders my creative process. Anna's Adornments is all about the joys of jewellery-making. Read more about Anna's blogs & shops here. To see my First Commenters List, please click here. See an extra blog here! What time is it in Sweden now? How many posts & comments does Anna have? Visit Daisy the Curly Cat and Harley! This is a Flickr badge showing public photos and videos from Parltradet/ChristinaWigren. Make your own badge here. First post about fire click here. My site is worth$594,441Your website value?